Kettle Brand certainly keep it simple. And so shall we. Color coded bags. Colors associated with the flavor. Minimalist design. Plain but fairly ideal for marketing purposes. However, the color for this variety - brown! Really? 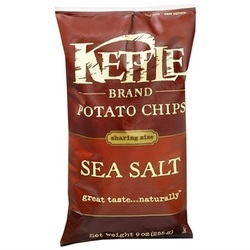 The crispy bubbly parts and the crunchy thick parts, plus the Kettle Cooked nature of the Chips, provided a firm and sturdy snack. Perhaps we should have expected it with a bland flavor, but these Kettle Chips lacked seasoning as part of the texture. There were some mixed sized oil bubbles and some brown edges, but these looked fairly clean, light and bright in texture and coloring. Sea Salt mixed with potato. The most traditional Chip you could imagine. Also, Kettle Cooked, to add further traditional appeal. It would however, take a far more trained palette than ours at Chips & Crisps to determine where these would rank among the legions of plain regular Chips that have accompanied sandwiches over the decades. We would actually say that without flavoring, oily salty potato flavored Chips are invariably much of a muchness.